Visit Boston's famed, National Historic Landmark where liberty found its allies and the American Revolution gained its voice. Within the walls of Old South Meeting House, meeting by meeting, vote by vote, a revolution began. Since 1729, when it was built as a Puritan meeting house, Old South Meeting House has played an important role in American history. It was on this site that the Judge Samuel Sewall publically apologized for his role in the Salem Witch Trials. It was on this site that Benjamin Franklin was baptized. It was on this site that slave and poet Phillis Wheatley explored the meaning of liberty. In the years leading to the American Revolution, thousands of colonists gathered at Old South Meeting House to challenge British rule, most famously to protest the Boston Massacre and the tea tax. 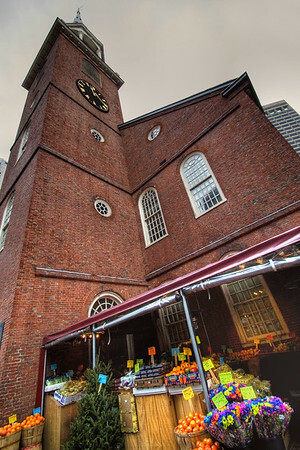 The largest building in colonial Boston, Old South Meeting House was the stage for an overflow meeting on December 16, 1773, which adjourned to Griffin’s Wharf for the infamous event that would become known as the Boston Tea Party. Today Old South Meeting House is open daily as a museum and treasured landmark and keeps its revolutionary heritage alive as an active gathering place and a haven for free speech in the heart of downtown Boston. The exhibit Voices of Protest traces the story of the people who have made history at Old South Meeting House. Explore the rich history of the Meeting House through rare artifacts, such as a vial of tea from the Boston Tea Party and a 3-D historic model of colonial Boston.